Uh-oh! Is Windows 10 making Cortana the next Clippy? In the next major Windows 10 update, Cortana could jump from the taskbar to float on top of your entire desktop. Microsoft sources have told The Verge, that the next big Windows 10 update codenamed Redstone will make Cortana much more integrated with the entire Windows 10 experience. Rather than simply working behind the scenes and only appearing when summoned with the Start button, Cortana will purportedly float around Windows 10. For instance, when you're working on a document, Cortana will supposedly provide information and render assistance as you type. Within Office 365 applications, Cortana could purportedly see who is editing a share document and surface useful information to help the user. This all might sound like the return of Clippy, the old Office assistant, but sources in the know claimed Cortana will pop up less and act more like a powerful search engine built right into the OS. 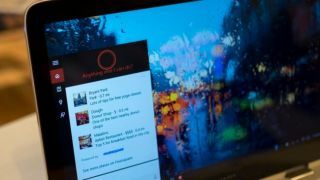 Overall, the report suggests that Cortana will have more access to Windows 10 features such as muting notifications when you're on a Skype call. It will also reach into Microsoft's larger software platform, potentially integrating widgets into the notification area. Beyond desktops, Microsoft is also purported turning Cortana into a Google Now like service for Windows 10 Mobile. With this change, Cortana could appear to offer contextual information and search queries based on where you are and what you're doing on your phone. What new Windows 10 features will Microsoft reveal at CES 2016?